COLUMBIA, South Carolina (CNN) -- South Carolina Gov. Mark Sanford spent Thursday with his family, a day after he admitted to having an extramarital affair with an Argentine woman, his office said. Gov. Mark Sanford tells The State newspaper he is surprised the story was attracting such attention. "He'll also be taking some time today to touch base with other state leaders as well." After disappearing from the public eye for nearly a week, Sanford, 49, admitted Wednesday that he had not hiked the Appalachian Trail -- as his staff had said earlier -- but had been in Buenos Aires, Argentina. He also acknowledged having an affair with an Argentine woman, whom he described as "a dear, dear friend." CNN's sources in Buenos Aires and in South Carolina identified the woman, whose name was also widely reported in Argentine media, as Maria Belen Chapur. The governor's disclosure prompted one newspaper in South Carolina and one of the state's top Republicans to call on Thursday for his resignation. Sanford "cannot navigate a deep and painful personal crisis and lead the state through its economic crisis at the same time," said an editorial in The Spartanburg Herald-Journal. The paper said South Carolina needed a spokesman who could talk to potential employers without having to answer questions about his personal life. "And the state needs a leader it can trust as it deals with the troubled economy. 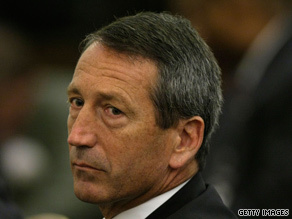 Sanford has destroyed that trust," it said. A key South Carolina Republican cited Sanford's past criticism of Bill Clinton, and accused the governor of hypocrisy. "He was saying our elected leaders need to stand firm on principles and values, and one of those is strong family values," said Glenn McCall, a member of the Republican National Committee. The State, the Columbia-based newspaper that acquired what it said were e-mail exchanges between Sanford and the woman, acknowledged Thursday that there would likely be people who would call for the governor's resignation. "We are not ready to join them at this point," the editorial said. The State said it acquired the e-mails in December. The governor's office confirmed their authenticity Wednesday, the newspaper said. When contacted by CNN, a spokesman for the governor would neither confirm nor deny the authenticity of the e-mails. The affair began in the past year and was discovered five months ago, Sanford said Wednesday without elaborating. He added that he and his wife were trying to work through it. He implied that he had ended the affair, saying, "And the one thing that you really find is that you absolutely want resolution. And so oddly enough, I spent the last five days of my life crying in Argentina." Also Thursday, the governor said he would repay South Carolina for the Argentina leg of a state-funded trade mission last year with the Department of Commerce. "While the purpose of this trip was an entirely professional and appropriate business development trip, I made a mistake while I was there in meeting with the woman who I was unfaithful to my wife with," Sanford said. "That has raised some very legitimate concerns and questions, and as such I am going to reimburse the state for the full cost of the Argentina leg of this trip." The South American trip took Sanford and several commerce officials to Brazil and Argentina for one week, beginning on June 21, 2008. According to state expenditure reports, Sanford's expenses for out-of-state travel with the Department of Commerce were $21,487 for the fiscal year ending June 30, 2008. Governors commonly travel out-of-state or abroad to stir up investment in their home states. It was not immediately clear how much of the expenses the Argentina portion of the trip comprised. Sanford said in the news conference Wednesday that he footed the bill for his most recent trip to Buenos Aires, which occurred in the past week. CNN's Peter Hamby, John King and Jackie Damico contributed to this report.